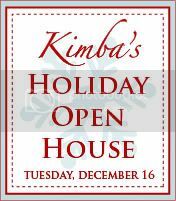 Kimba's holding a holiday open house today, and I just couldn't resist joining in on the fun. For those of you who are regular readers I hope you can put up with a few repeats (I did throw in some new stuff for you though!) And for those of you who are new...Welcome to my Shabby Nest! I hope you enjoy your stay enough that you will come back and visit again! and here it is with the stockings I made for the family. You can read more about them (and see them better)here. and I also have some on this little tree. I love making pixies...here is my latest addition. And I LOVE filling apothecary jars! Oh yes I do! If you want some easy-to-make decorations...try making some of these cute Christmas Topiary Trees. I show you how here. Nothing like a festive birdcage...just loaded it with my favorite toile ornaments and some glass balls, and voila! And, of course, the tree. (the kiddos did a great job decorating it!) You can see some fun closeups of the ornaments here. Here's a cute little snowman that my lovely mother-in-law gave me. He keeps court in the laundry room/half bath. This little bunny (also a gift from my M-I-L) keeps watch for iceskating opportunities in the library. Even the kiddos' rooms have a dose of Christmas cheer...you can read more about that here. And of course, a stash of candy canes is a must. Finally, a little of my exterior decor. You can read more about it here. Thanks for dropping by. Stop by later this week for a pixie tutorial! your home is just so cute. I haven't seen anything that you do that I don't just love! OMG. I must have been channeling you with the trees!!! Love your decorations! Love the trees you made, what a great idea! Your home is so cute! I love the pixie!!! You are very creative. Thanks for letting me stop by! Have a wonderful Christmas! Now, I have got to tell you that your ice storm pictures are incredible. It just looks unreal and etherial. Tell the firedog that he has still got it. Those photos take my breath away! Love the key idea, that is really sweet!! Your decorations are just wonderful!!! Your outside looks great too! Everything's so pretty. I love the tree. I want to come visit....thanks for inviting me to your open house!!! You do amazing work! Everything is absolutely beautiful! Feels like Christmas in your home! I really enjoyed the tour...I especially love that wreath made from upholstery webbing...gotta try that!! Blessings! Wow, I love all your decorations! Your staircase garland looks awesome! WHat a lovely home, just found your blog and so happy I did! Absolutely wonderful. LOVE your stockings..... thanks for letting me visit. Looks just as good the second time around! Love the pixies! Everything looks so good the trees are great and of course I loved the snowman. ooooo! your garland is to die for! i love snowflakes, too! :) happy open house day! Love it! I really loved your garland. Great job! I had never considered a Santa key before...good idea! I also love those snowflakes hanging from the light! Beautiful stuff! You have made a lovely Christmas home for your family! Beautiful! Very Pretty! I adore your outdoor weraths. Merry Christmas! Your decorations are great! Love the little tree with the snowflakes and that wreath really pops against that black cabinet. what a spunky kind of creative touch you have. love it. Hey I love your snowflakes falling from your chandelier! I love filling glass jars with festive things too. The wrapped gift in the apothecary jar is a great idea! So pretty! The snowfalkes are so pretty falling from your chandlelier and our railings are beautiful. I really liked your bunnies and your jars filled with Christmas treasures! I love the snowflakes and apothecary jars! Soo cute! Beautiful decorations in your home. Merry Christmas! Lovely decorations and presentation. You must tell us where your found that Santa key...I love it. I wouldn't mind Santa bringing me a key like that for my stocking! Hi Celestial Charms...the Santa Key is from Longaberger. I got it quite a few years ago, so I don't know if they still make them. I LOVE those topiaries! I made one using red bead garland but I love the yarn ones, too! What a gorgeous home you have Wendy.It's so beautifully decorated.Merry Christmas. I love your stair garland. It reminds me that I need to fix my puny thing! I love that wreath hanging on the back cupboard. Love your Christmas decor! The Santa key was especially cute!